Drive in either lane with a two-second time interval between you and the vehicle ahead. Quickly switch back and forth between the lanes. Always allow at least two seconds of space between you and the vehicle in front of you. This allows you room to react to the actions of other drivers. You must always leave adequate space between vehicles, regardless of if you are in a hurry or not. Stop and look for other vehicles, then go if there is no traffic. Speed up to clear the intersection quickly. A flashing yellow traffic light means drivers should slow down and proceed with caution. Vehicles being struck from behind is a common occurrence on the roadways. To avoid this hazard, leave a minimum two-second interval of space between you and the vehicle ahead of you. Warning signs prepare drivers for upcoming road conditions and hazards and are usually yellow with black markings. 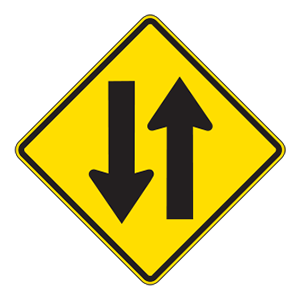 This sign tells drivers that they may encounter traffic coming from the opposite direction.